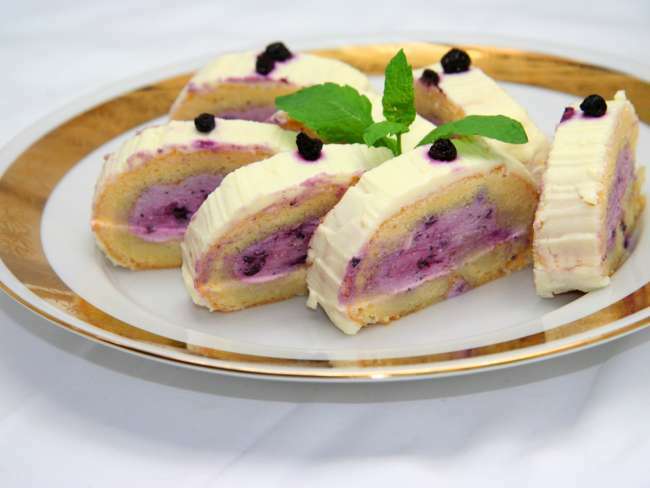 Excellent jelly roll from sponge cake filled with refreshing cream cheese and blueberries. Beat egg yolks with sugar into foam. Beat egg whites into stiff foam and carefully mix into the egg yolks. Add flour mixed with baking powder and gently stir. Spread dough over the greased and floured baking tin. Bake in the oven at 390°F (200°C) for about 10 minutes. Beat cream cheese, softened butter and sugar until it's smooth. Split cream into two bowls. Put aside 1/3 of cream to cover the surface of jelly roll and mix blueberries into remaining 2/3 of the cream. Unroll the cold cake base and fill it with blueberry cream and roll it again. Cover surface of jelly roll with the remaining white cream. Decorate with blueberries. Let the jelly roll stiffen in fridge.